There's just STUFF. Stuff in the drawers, closets, basement, my purse! I want it gone. I want some space, some organization, and some calm. BUT every time I go to start it becomes WAY TOO MUCH! So lately I've been researching how best to cut the crap. How can I move toward a more manageable co-existence with the items I love, need, and want to keep? And I found The Minimalist Game. It's a way to slowly tackle the clutter and simplify our space. But because I've always found taking on challenges is WAY more fun with friends and support and inspiration I started the Cut the Crap Club Facebook Group. This Facebook group of awesome peeps are, like me, committed to getting rid of a lot of CRAP throughout the month of October. Each day remove items of clutter. The NUMBER of items corresponds to the date. October 10th = Ten items to toss, donate, or sell. By October 31st 496 items of CLUTTER are out of your life! 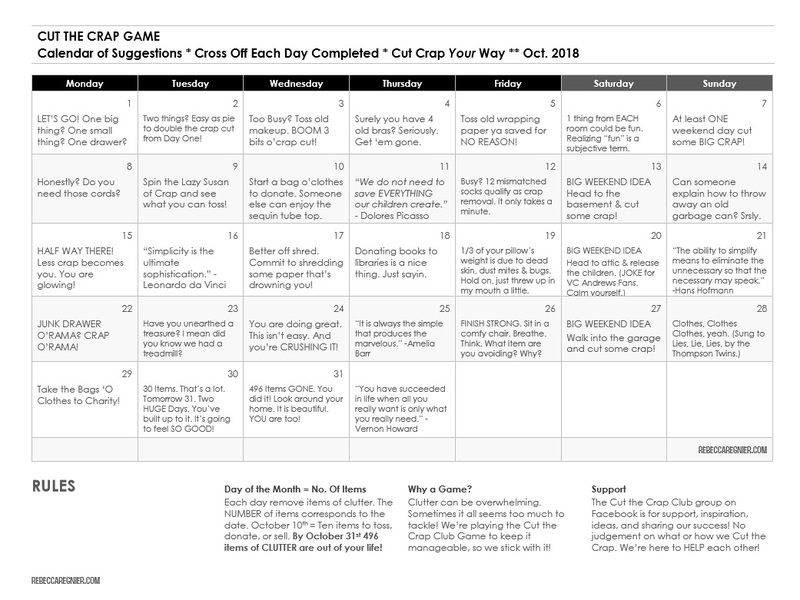 I've created a fun calendar for inspiration and entertainment as we all Cut The Crap. (Click on the below link to get the PDF to print.) Plus, our group has Angie Weid, a professional organizer, seen on the t.v. show Hoarders, on board to help with questions or if we get in over our heads! We're accepting new members for October's challenge up until midnight on October 1st. Join us if you need support and want to CUT THE CRAP in October. We will all be posting our triumphs, suggestions, philosophy, resources, and atta girl/boys in the group. 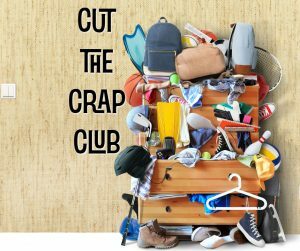 Interested in joining the cut the crap group. WE’re on Facebook! Come on over!